The comments section of my blog was disabled for a few days. I had experimented with another comment program called Disqus – for you bloggers out there, a friendly word of warning. I HATED that program. It took over my comments, was difficult to use, ugly to look at, and a pain to uninstall. When I finally did manage to get it off here it disabled my comments and I had to reinstall my template, which was yet another pain. I lost a few comments that were made from folks in the interim. All in all, not a good experience. 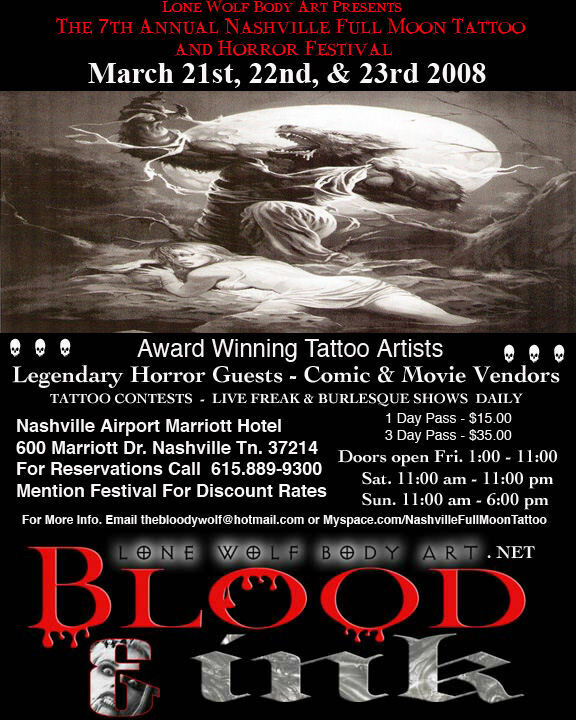 This weekend is the Lone Wolf Full Moon Tattoo Festival in Nashville. I am going to try and make it out there one day this weekend. Hope to see you there. They have some great guests and you can see the entire list here. 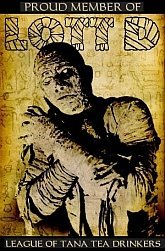 I have another Creature Feature airing next week. The movie I’m hosting this time around is THEY CRAWL. It is a pretty awful movie about genetically mutated killer cockroaches. Features some really terrible computer generated roaches which have to be seen to be believed – at one point they al form together into one giant roach – yes! It airs on the Nashville CW58 at 1pm, Saturday, May 1st. This was one of the movies we shot host bits for back in October but due to technical difficulties it never aired. I figured now was as good a time as any, so May 1st it is. Speaking of May 1st, that is the date of the next Spookhand show, too. It takes place at The Muse and features 4 bands: Spookhand, Alucard, Uncle Skunkle, and Dirty Dee and the Sweaty Meat. We’ll be playing a couple of new songs, so should be good - or a disaster, one or the other – but one thing’s for certain, we’ll have fun either way. I missed a movie at the Nashville Film Festival last night that I had fully intended to see. Vampire Girl vs. Frankenstein Girl. A Japanese fright fest featuring exactly what it sounds like, monster femme fatales fighting... Should drive the fan boys wild! Hate to miss a good old fashioned monster flick like that, seeing as they don’t come to the big screen that often. I’m proud of the Nashville Film Fest for including this one. 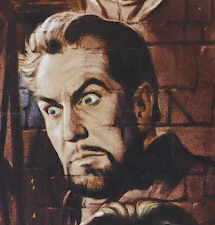 It isn’t often they show horror movies, and certainly not ones as purely exploitative as this. I’ve been feeling a little down and nostalgic lately. My middle son Ian is graduating high school this year. Man it seems like only yesterday he was 8 years old and dressing as Dr. Gangrene for Halloween. That was one of the biggest thrills since doing this show – how many dads get to say their son dressed as them for Halloween? Now he’s 18 and about to head to college in the fall. Sigh. Time really does pass too quickly – but he’ll always be my little buddy. Well that’s all for now. I have a bunch of other good stuff coming in the near future – more original artwork, more interviews, more reviews and more videos - so stay tuned! !